First of all, be sure your cat is current for all vaccinations and healthy enough to travel. Make an appointment with your veterinarian, and get the appropriate health certificate for your destination. Most importantly, be sure your cat travels without stress. 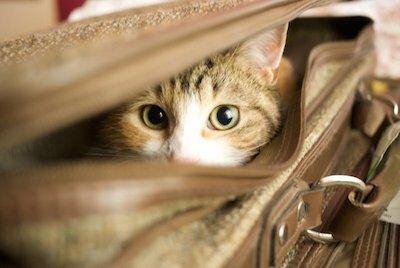 Some cats travel easily, especially if you start traveling when they are young, but some cats will NEVER travel well and should stay in a safe boarding facility while your family is away. Besides traveling well, they must be able to adapt to a new environment (your hotel room) without destroying it, themselves, or you. If you are not sure, start with a short trip overnight, and see how it goes. A curious cat is usually happy. Confirm that your hotel is pet friendly, and your cat is hotel friendly. Pet friendly hotels are often listed on old, deserted websites, and policies can change. You don’t want to get there only to find out that they have changed policies and you will have to kennel your cat. Sometimes it is difficult to find a boarding facility that accepts cats, and vacations plans can come quickly to an end. If your cat shreds furniture or urinates outside the litter box, you will not be invited back and will probably have to pay for any damages. Remember to bring supplies, including a scratching post if driving. Consider sending one to your hotel ahead of time if flying or purchasing an inexpensive one when you get there. Don’t assume your hotel is not pet friendly. Again, policies change, and many higher quality hotels are now recognizing all members of the family. Some will also take pets on a limited basis, even though their policy may be “no pets.” It doesn’t hurt to ask. Space may be limited to certain rooms, so be sure to mention it when you make your reservation. Ask about fees. Some hotels charge by the pet, the night, or simply require a refundable deposit as long as your pet is not destructive. Make your hotel reservation first if you are flying. Airlines only take a limited number of pets per flight. It is easier to cancel a hotel reservation if you can’t get a flight than it is to cancel a flight if you can’t get a hotel reservation. If flying or driving, be sure your cat can stay stress free in a carrier for a few hours. If flying, he must be able to relax with the engine noise on a plane, and if driving, the noise of your car and passing vehicles. Be sure you can handle your cat; you will need to take him out of the carrier and walk him through the metal detector in airport security, while the carrier goes through the x-ray machine. Often security will also test for explosives by rubbing a small strip on you and your cat to place in a detector. Place a disposable towel or absorbent pad in the bottom of your cat carrier, just in case the trip is long. If you have room, bring an extra towel in case you need to change it, and a plastic bag to discard the soiled one. Most vacation destinations in the U.S. will have a nearby supermarket to pick up supplies, but I carefully pack my clothes around a brand new litter box in my suitcase, with a small amount of litter in a bag so there are no accidents upon arrival. If driving, you can bring a bag of your cat’s favorite litter. If flying with a small amount of litter, be sure to leave it in its original packaging or you might be suspect going through security. Remember all your cat’s supplies: water and food dishes, cat food (you can probably buy it at your destination, but be sure of that if you have a finicky cat), comb, toys, litter box and a small amount of litter for arrival, flea, tick and heartworm preventives (although better to apply beforehand), any medication prescribed, and a camera for a selfie with your cat! Upon arrival, get your cat set up first. Traveling is always a little stressful, even for people, but we can always eat along the way and use a rest room, while cats cannot. I always set up the litter box first, then food and water, then let the cat out of the carrier. If your cats are comfortable in new places, they will probably seek out the food or litter box first, and then explore every corner of the room. Use encouraging words like, “Good boy! We’re on vacation!” Cats will pick up on your emotions and feel confident if you do. Having the room set up with their own items, adds to their sense of normalcy. Scatter their toys on the bed and around the room; this will also prevent boredom and mischief while you are not there. You can use your suitcase or bring extra towels to block any areas you want to prevent your cat from getting into or behind (like behind a dresser or bed), and be sure there aren’t any “escape areas” I once stayed in a hotel that had an enclosed balcony with a windowsill shared by all rooms. I didn’t want to have to knock on my neighbor’s door to retrieve my cat! Find out from the front desk of your hotel how cleaning is arranged to be sure your pet is protected. Most are willing to arrange a time so that your cat is not able to escape during housekeeping (mutually beneficial for you and the hotel’s reputation). If you are nervous, or your cat doesn’t like strangers or noisy vacuum cleaners, either take him out in a carrier or pet stroller until housekeeping is completed or invest in an escape proof cage to use while you are gone. Some of these ideas may seem outlandish, but experience has allowed me to have many fun-filled vacations, complete with furry family. It simply takes a little preparation, but traveling with a calm cat can be fun and calming for both of you!